When someone says the word farm, what do you envision? Perhaps a field of wildflowers gently swaying in a summer breeze or a rustic old red barn with chickens quaintly pecking the ground in front of it. Maybe you picture large pasture with perfectly bailed hail dotted throughout and cows grazing on the other side of a wooden fence. These are great visuals, but most days aren’t quite so picturesque and some days are just bad. REAL life is failures, dirty messes, and poop. Somedays REAL life on our Johnston County farm includes death. Why would I write about death you may ask. Because death is real and it is hard. We want our community to know who we really are and to connect with us through our highs and lows. Today we had a low, sad moment on our farm and I am not ashamed to share it with you. Our two oldest children have quite a few chores on our farm and we pay them accordingly. 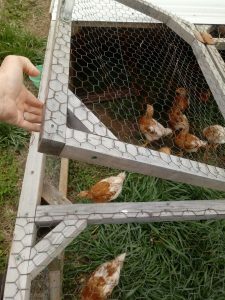 Today as our 7 year old was feeding the month old pullets (female chickens), one of them jumped up toward the door of the coop. The door is on top of the coop and opens up like a chest freezer. The jumping chicken startled our daughter and she quickly let go of the door causing it to close quickly. In a freak accident the pullet’s head and neck got caught in the slamming door. 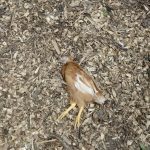 The young chicken dropped to the ground and flopped around quite a bit. In the thirty seconds it took me to get over to the pen it died. Our daughter felt horrible because she caused the death of an animal. Most of the time real life on our farm is slower than the 9-5 life. This speed gives us time to do the urgent things and let the important items wait just a touch. I wasn’t in a rush to get to work or school (we homeschool, for those of you that are new to our community), thus I had time to stop what I was doing and mourn for a brief moment with my first child. It allowed me the time to hug her and tell her she wasn’t in trouble and that these terrible things happen from time to time. I also was able to check with her several more times throughout the day. Our Johnston County farm has amazing moments nearly every day. It requires an almost endless amount of human toil and can sometimes get tedious, but it is real. As farmers, we get to directly see how we are influencing the land, the animals, the community, and our own family. On those rare occasions when our influence is bad, we learn from those mistakes and grow positively, not just with our minds, but also our souls. Death is so very hard, but with careful, purposeful attention it can create a deeper apreciation for life and all that goes into making it REAL.